In this guide we’ll take a look at the best charcoal garden storage benches for the UK market. What Is The Best Garden Storage Bench? 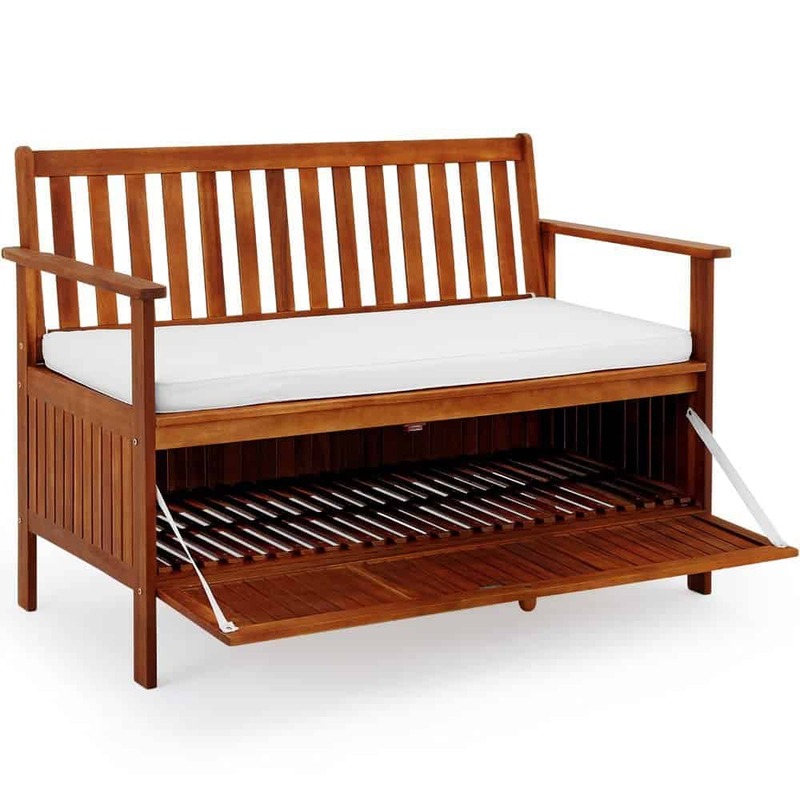 This Keter Eden Garden Storage Bench is water resistant and weather resistant. It’s also stylish and has an enormous capacity for storage inside! It has room for two adults to sit comfortably side by side and has a very useful capacity of 265 litres. This makes it ideal to store cushions, toys, or any other kind of garden or patio accessory that you see fit. It is also safe to store items that need to be kept dry yet ventilated. The sturdy plastic is finished in a decorative wood-look and is fully lockable, giving you added security for your valuables. This outdoor storage bench is well-made, stylish and practical. It wins first place for the best garden bench for the money! 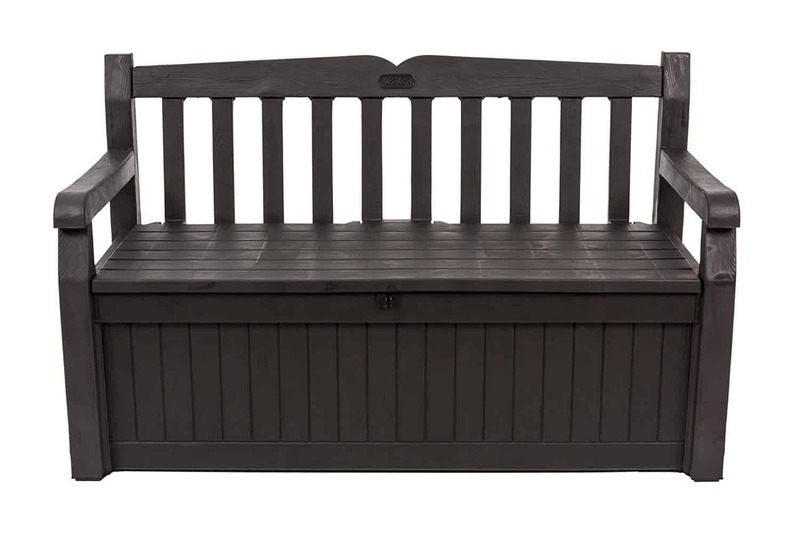 This Keter Eden Plastic Garden Storage Bench is very similar to their previous offering but comes in a stunning brown finish to really allow it to blend into a garden with lots of greens and browns. The capacity is again 265 litres and it can still comfortably fit two adults sitting on it side by side, or three children. It’s an ideal size outdoor storage bench to store small tools and other smaller gardening instruments like trowels and pruners. The bonus of buying a bench storage box made out of durable resin, as opposed to wood, is that it is virtually maintenance free, perhaps just requiring the occasional wash. It is even UV resistant to ensure the sun doesn’t fade it. This Wooden Bench With Under Seat Storage comes in a stylish wooden finish, this means it will look great in your garden, in your home, or even in between in your conservatory. This garden storage bench is very comfortable, thanks to its hard wearing polyester cushion, the cover of which can be washed allowing you to keep your bench in pristine condition. The bench itself is made of a sturdy acacia hardwood and is 120 cm long, easily wide enough to sit two to three people side by side comfortably. The storage box underneath is accessed by opening a door at the front. It is easily big enough to store any garden utensils or outdoor toys. This stylish and versatile garden storage bench is made from a hard wearing plastic resin that will never rot or decay, and is very simple to maintain in the long term. The 265 litre storage is accessed by open and close piston hinges ensuring safety at all times, and there is also a space to fit a padlock so more valuable tools can be stored with peace of mind. The width is a generous 140 cm, meaning two adults can sit side by side and still have room to spare. The arms of the bench are reinforced and set into the frame itself, a long lasting design that will also provide stability. This Norfolk Leisure Iceni Garden Storage Bench is versatile and hard wearing. If you’re looking for the best garden bench this is an excellent choice to go for! This Monks Garden Storage Bench is a stylishly designed, wooden bench with storage space underneath the seating part. It is one of the smaller benches on the list which makes it the ideal choice for the smaller garden as it can fit into tighter nooks and crannies. Smaller gardens also require more discreet storage as there isn’t often space to put a shed or a larger outdoor storage container. This garden storage bench not only provides storage space for cushions, tools and toys, it also doubles up as a comfy place to sit for two people. The size of it also makes it a viable consideration for a children’s room that needs a chair and a toy box in one. Style – The initial choice you have to make when deciding on which garden storage bench is best for you is what material it is going to be made out of. As you can see from the list above, there are just two main materials to choose from, plastic resin or wood. The plastic resin is a more modern choice and often comes in a style that is made to resemble wood. The advantage that this material has over wood is that it is much more durable. Plastic is weatherproof and waterproof, it is difficult to damage and very easy to maintain. A wash with soap and water once a year will usually suffice. The more expensive plastic benches will also be treated to ensure protection from the sun. This means they won’t fade if exposed to continuous sunlight. Wooden benches are a lot harder to maintain but have the obvious advantage that they just look better, and offer a more timeless and classic appeal than a plastic bench. Seat Size – There are two reasons to be concerned with seat size. The first is the consideration of exactly where are you going to put the bench. A storage bench often appeals to people with smaller gardens, so finding a bench that fits yours is obviously an important consideration. The second thing to consider is exactly how many people are going to want to sit on it? Ensure you get a bench that will fit the required number of bottoms to avoid arguments! Storage size – The last thing to consider is the size of the storage that the bench offers. The storage space is obviously important to you, otherwise you’d be looking at a normal bench as opposed to one with storage included. Whilst storage benches don’t offer masses of space they are very handy for various children’s toys, BBQ utensils, gardening tools, outdoor cushions. Take a look at what you want to put into it and consider if it will fit. Remember, if storing cushions you will most likely require a waterproof plastic resin bench. Whatever the reason for considering a purchase of a garden storage bench, you can find one that’s perfect for you in the list above. If your reason is practical, then consider a plastic bench which not only has virtually zero maintenance, it also offers a wider range of storage potential with its waterproof insides? If you’re looking for a stylish addition to your garden with the added bonus of extra storage space, then perhaps consider one of our wooden suggestions?